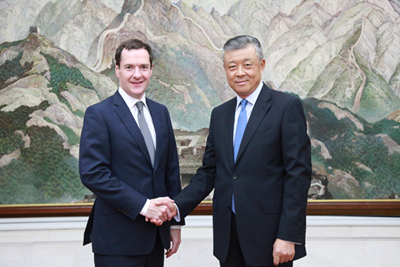 On October 10, 2017, Ambassador Liu Xiaoming met with George Osborne, UK former First Secretary of State, former Chancellor of Exchequer, and Editor of the London Evening Standard, at the Embassy, and exchanged views with his guest on China-UK relations and international issues of common concern. Ambassador Liu spoke highly of Mr. Osborne's contribution to China-UK relations while he served as the First Secretary of State and Chancellor of Exchequer and his commitment to developing cooperation with China. The Ambassador said that this year marks the 45th anniversary of China-UK ambassadorial relations, and it is also a year for consolidating the "Golden Era" of China-UK ties. The exchanges and cooperation in various fields between China and the UK have been very productive. China is willing to work with people from all walks of life in the UK to further deepen the strategic mutual trust and practical cooperation so as to make greater contribution to the China-UK "Golden-Era". Mr. Osborne said that it is in the interests of Britain and the consensus of all political parties of the UK to have closer relations with China and expand China-UK cooperation. He would like to continue to play his positive role in strengthening the exchanges and cooperation between China and all sectors of the UK and in helping to consolidate the "Golden Era" of China-UK relations to benefit the two countries and the peoples.